A Rare Visit Inside A Chinese Courtroom Politically sensitive trials in China are often held in courtrooms sealed off by police, and foreign reporters are barred. But in recent years some Shanghai courts have been holding open houses and live-streaming select cases. An NPR reporter recently was allowed to watch legal proceedings at Hongkou District Court — a rare opportunity for a foreign correspondent in Shanghai. 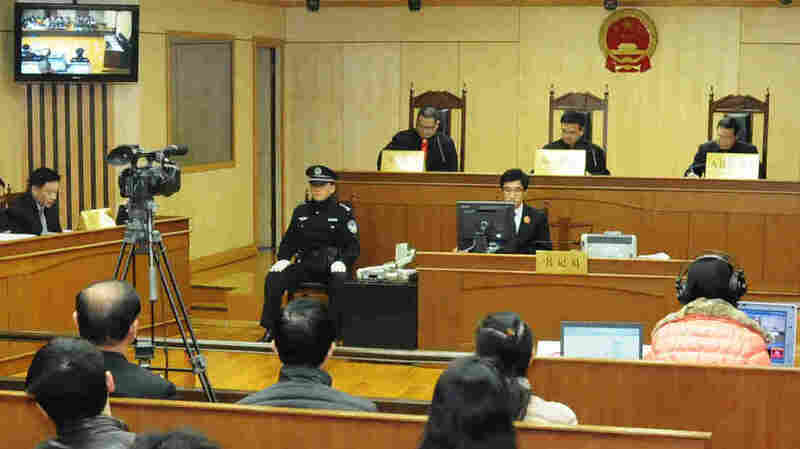 After years of covering China, I finally set foot in a Chinese courtroom last week. Foreign reporters need government permission to enter Chinese courts and past attempts had gone nowhere. The last case I tried to cover was in August and involved Gu Kailai, the wife of disgraced Communist Party leader Bo Xilai. And by "covering" the story, I mean standing in the rain with a scrum of reporters as police formed a human fence around the courthouse in the central Chinese city of Hefei. Gu was convicted of killing a British businessman in a brief, highly choreographed trial. My visit to a Shanghai court last week focused on a far more typical case and was more encouraging. The occasion: the city's Hongkou District Court had invited several dozen residents to watch a lawsuit as part of an open house it holds every few months. Chinese citizens can attend most court cases as long as they show their government-issued I.D. cards. In an attempt to educate the public, all of Shanghai's 17 district courts have been streaming select cases on the Internet in recent years. 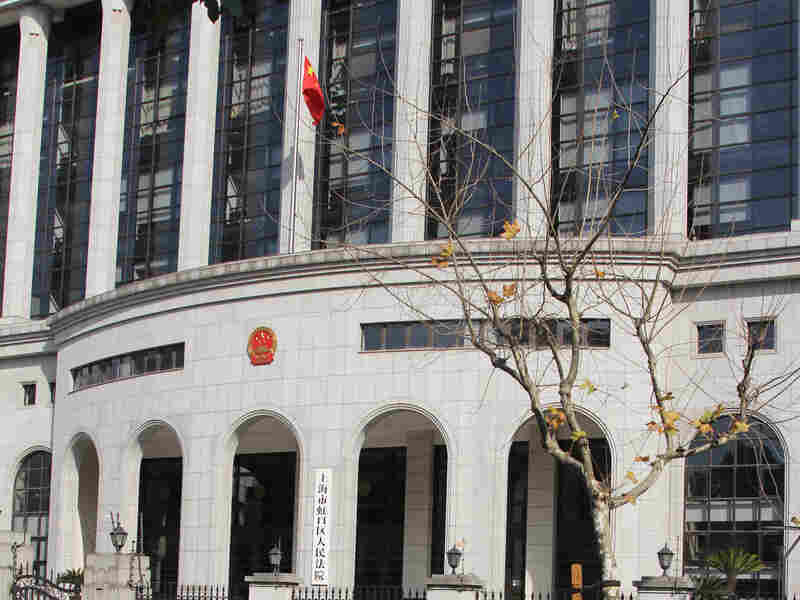 Shanghai's Hongkou District Court holds open houses every few months and live-streams select cases. On the docket that day — and advertised on a jumbo screen outside the courthouse — was the case of the bungled drug shipment. A Chinese pharmaceutical company in neighboring Zhejiang province sent anti-cholesterol drugs to India. It claimed the shipper had mislabeled the ingredients and the buyer had sent them back. Now, the drug company wanted $61,000 in compensation. The evidence: a forged label — an apparent attempt to cover up the shippers' incompetence. The court was modern, all blond wood with two flat-screen TVs. There was no jury, no witnesses and little evidence. By American standards, the proceedings seemed a bit informal, like a few guys sitting around working out a dispute. The plaintiff's attorney spent most of the trial on the attack. "It was already stated clearly that your employees' failures inconvenienced us and your client deeply regretted that," the plaintiff's attorney said, speaking directly to the defense. "In other words, you guys faked the stamp and the label, not other people." Not wanting to admit fraud in court, the defense attorney denied it. Chief Judge Yan Menggeng, who wore a black robe with a red stripe down the front, chimed in: "Have both sides signed a written contract?" That's not uncommon in China, when companies have a long working relationship — and where contracts have often been ignored anyway. After 90 minutes, the judge asked if both sides were willing to settle the case with the court's oversight. The plaintiff said yes; the defense needed to talk to his client. And with a bang of the gavel, court adjourned. Bao Huimin, a senior judge at Hongkou District Court, says cases like this serve as education for the masses. "The general public can understand the legal process through Web streaming, so that their right to know and right to supervise can be protected," he says. On this day, not everyone was "supervising" the process: One man in a gray sweater dozed off with his chin on his chest; others sent text messages. Officials told me I was the first foreign reporter to ever visit the court. I had to wonder if some of the people were there for my benefit. But one man in the gallery — a businessman named Zhang — said he comes several times a year to learn about the law. Zhang, who didn't want to give his first name, said knowing the law didn't used to matter much in China. "Back then, our understanding of laws was they were very distant from us. We thought in our hearts we wouldn't do anything to violate the law and laws seemed irrelevant," he says. But Zhang says there's more enforcement these days and he has to be more aware. In 2008, China enacted a labor contract law that made it harder to fire people and required serious severance money. "Take the issue of employees' annual paid leave," says Zhang. "Before, companies didn't pay much attention to this. Now, with the new labor law, companies take this very seriously." Si Weijiang, a Shanghai lawyer who has practiced for two decades, says courts on China's developed coast generally handle lawsuits well. "Normally, in a civil case, if there is no corruption or no influence by the government, it's independent," Si says. The problem, he continues, is criminal cases, where the prosecutor and police have enormous influence and the conviction rate is more than 99 percent. Si says political cases are even worse. The Communist Party ultimately controls the courts and can call the shots. Take the case of Chen Kegui, who Si was hired to represent. Chen is the nephew of Chen Guangcheng, the blind lawyer who escaped from house arrest last winter and humiliated the Communist Party. After his escape, police went to Chen Kegui's house. "Over 20 people — at midnight — illegally enter the house and break the door and beat him," Si says, "so he has no choice." Si says Chen Kegui fought back in self-defense, but Si was never able to tell the court that because authorities refused to let him appear on Chen's behalf. Earlier this month, Chen was convicted of assault and sentenced to more than three years in prison. The government allowed no reporters in the courtroom and didn't live-stream the case.